I was born and grew up in Dublin in a large Catholic family, there are seven of us, and I am the youngest girl. My parents have great faith and this was a big influence on us as we grew up and still is. However like most young people of that time almost all of us fell away from any real practice of our faith once we left home. I have no doubt that my parents constant prayer for me has played a huge part in my path to monastic life and growing relationship with God. I admire them and am so grateful; they have never stopped questioning and growing in their faith. Now we have great chats! After finishing school I studied for a degree in Environmental Biology at University College Dublin and followed this with a Master degree in similar studies in Aberdeen, Scotland. I had always been interested in the natural world, caring for the environment and living in harmony with the world around me. I imagined I would become a Greenpeace activist… saving the Whales or such like : ) I worked in the area of Science for several years after obtaining my qualifications, in Scotland and later returning to Ireland. I enjoyed the work very much. I had always loved the sense of excitement and discovery that comes with the Sciences. often sought in fleeting pleasures. I wondered about other ways to live. discovery and excitement. I attended Mass again. I was led to a Christian spiritual centre near my home. I began to read and to pray daily. I knew quite quickly that I would dedicate my life to this wonderful discovery. The desire to belong to a praying community grew and grew. From there it was simply a matter of God placing Glencairn under my nose in the form of an article in the weekend newspaper! A monastic experience weekend was coming up. I emailed Sr. Sarah and we agreed that I would attend. After several visits and an extended live-in during which I was supported in the discernment of my vocation I entered the community at Glencairn. Looking back over this journey I can now clearly see Gods guiding hand in it all, leading me, and creating a desire for Him in my heart. It has been an amazing and also challenging journey so far. I have a great sense of fulfilment here. Monastic life at Glencairn has all I need to be happy, all that I had been searching for in my life. 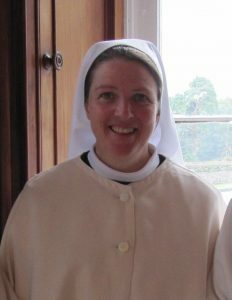 I am very happy here and so grateful to God for this wonderful gift of a monastic vocation.